The cemetery is located 18 km from Ieper town centre on a road leading from the N308 connecting Ieper to Poperinge and on to Roesbrugge. From Ieper town centre the Poperingseweg (N308), is reached via Elverdingsestraat then directly over two small roundabouts in the J. Capronstraat. The Poperingseweg is a continuation of the J. Capronstraat and begins after a prominent railway level crossing. On reaching the ring road of Poperinge, the R33 Europalaan, the left hand clockwise route circles the town of Poperinge and rejoins the N308 towards Oost Cappel. 10 km after rejoining the N308 lies the village of Roesbrugge. The second left hand turning in the village of Roesbrugge leads onto the Haringestraat and for 2 km to the village of Haringe. The second right hand turning in the village of Haringe leads onto Nachtegaalstraat. The cemetery lies 400 metres along the Nachtegaalstraat on the left hand side of the road. Bandaghem, like Dozinghem and Mendinghem, were the popular names given by the troops to groups of casualty clearing stations posted to this area during the First World War. The cemetery site was chosen in July 1917 for the 62nd and 63rd Casualty Clearing Stations and burials from these and other hospitals (notably the 36th Casualty Clearing Station in 1918) continued until October 1918. The cemetery contains 772 Commonwealth burials of the First World War. There is a separate plot of 39 German war graves, but four plots (X, XI, XII and XIII) of French graves were removed to other burial grounds after the war. There are also five Second World War burials in the cemetery, three of which are unidentified. The cemetery was designed by Sir Reginald Blomfield. Secondary Unit Text: formerly 2nd/9th Bn. 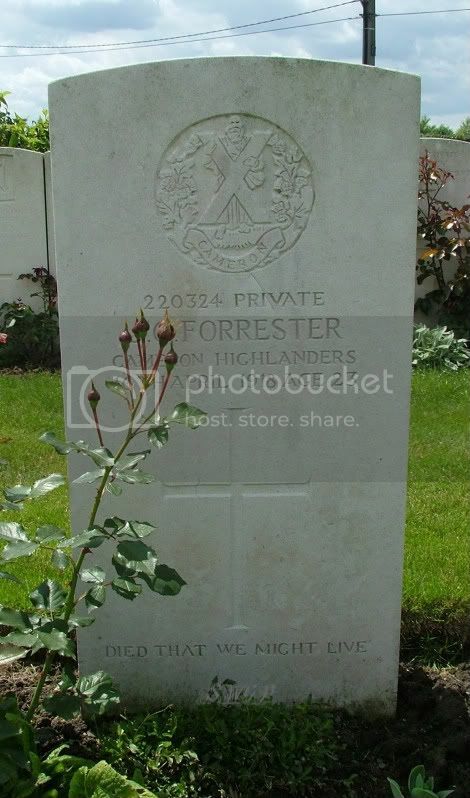 Additional information: Son of John G. Forrester, of "Ardenlea," Lenzie, Glasgow. Grave/Memorial Reference: II. E. 9.